Television continues to be the public’s top daily news source. In the current survey, 55% say they watched the news or a news program on television yesterday. That is little changed from recent news consumption surveys. In the 1990s, however, far more Americans said they watched television news yesterday. The percentages saying they listened to radio news and read a newspaper yesterday have steadily declined over the past two decades. 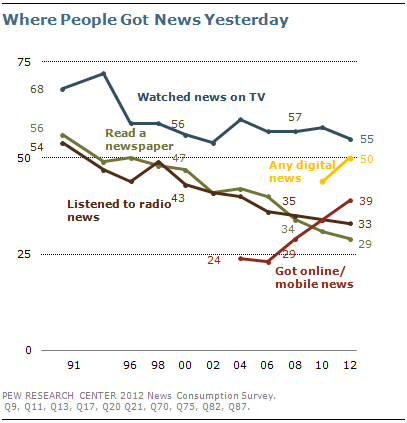 Currently, 33% say they listened to radio news, while 29% say they read a newspaper yesterday. Nearly four-in-ten (39%) got news online or on a mobile device yesterday, including cell phones and tablets. In 2010, 34% got news online; this did not include those who got news on a mobile device. In 2004, just 24% said they got news online during the previous day. When other online and digital news sources are added in – including seeing news on a social network or Twitter, getting news from email and listening to podcasts – the percentage getting news digitally yesterday approaches the share watching television news (50% vs. 55%). In 2010, 44% got news from one or more digital platforms yesterday. Despite the rapid growth of digital news, more Americans continue to get news from traditional news platforms than from digital platforms. Seven in ten (71%) say they watched television news, read a print newspaper or listened to radio news yesterday. That compares with 50% who got news from one or more digital platforms. By wide margins, Americans 50 and older continue to rely more on traditional news sources than digital sources. But the differences are more modest among those 25 to 50. And among the youngest Americans – those younger than 25 – substantially more get news digitally than from traditional news sources (60% vs. 43%). Moreover, since 2010 there has been a sharp decline in the proportion of Americans who got news yesterday only from a traditional news platform – from 40% then to 33% currently. As previous Pew Research news consumption surveys have found, a plurality of Americans gets news from both traditional and digital news sources – 38% currently, up from 34% in 2010. And the percentage relying only on digital platforms for news also has increased, from 8% to 12%. ion, print newspapers or radio, down from 40% in 2010. 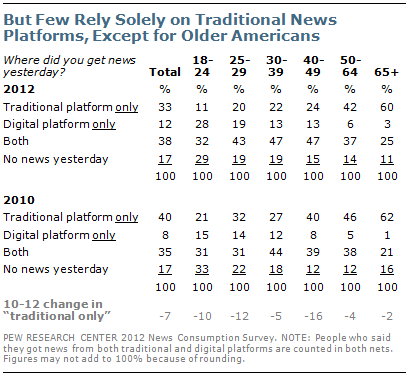 Two years ago, about as many people in this age group said they got news only from traditional platforms yesterday as from both traditional and digital platforms (40% vs. 39%). Today, nearly twice as many of those in their 40s blend digital and traditional sources as get news only from traditional sources (47% vs. 24%). In spite of an expanding variety of ways to get news, a sizable minority of young people continues to go newsless on a typical day. Fully 29% of those younger than 25 say they got no news yesterday either from digital news platforms, including cell phones and social networks, or traditional news platforms. That is little changed from 33% in 2010. Older Americans are less likely to go newsless: 19% of those between 25 and 39, and smaller percentages of older age groups, say they got no news yesterday. These figures have changed little over the years. Young people also consistently spend less time with the news than do older Americans, which is in part attributable to the relatively large share that gets no news on a typical day. In the current survey, those younger than 30 spent an average of 45 minutes getting news yesterday. Older age groups spent an hour or more with news, on average, with those 65 and older spending an average of 83 minutes with the news yesterday. Age differences in time spent with the news have changed little since the 1990s. While the proportion of Americans who get news from any online or mobile source now rivals the share watching television news, people spend far more time with television news than online news. On average, television news viewers spent 52 minutes watching TV news yesterday; fully half (51%) watched television news for an hour or more. Online and mobile news consumers spent 40 minutes on average with news online, and just 30% spent an hour or more. About half (49%) of those who got online or mobile news yesterday spent less than 30 minutes getting news from those sources. In fact, people spent more time on average getting news from radio than getting news online. And while just 30% of online news consumers spent an hour or more getting news from online and mobile sources, 41% of radio news listeners did so. Far more older Americans get news on a typical day than engage in a variety of other routine activities. Higher percentages of those 50 and older got news yesterday than visited with family or friends, called a friend or relative just to talk, or watched something other than news on television. 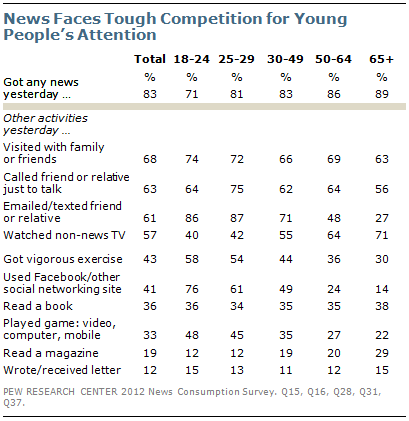 But for young people, news faces stiff competition from a number of other daily pursuits, particularly social networking. Among those younger than 25, as many used Facebook or another social networking site yesterday as got news from all sources combined (76% vs. 71%). More young people go on social networking sites than watch news or entertainment programs on television; just 40% of those younger than 25 watched something other than news on TV yesterday. Even among those 30 to 49, nearly as many used social networking sites (49%) as watched entertainment television (55%). Gaming also has become an increasingly popular daily activity. In 2006, 17% played games on a computer or video game console yesterday; in the current survey, 33% say they played a game yesterday on one of these formats or on a mobile device. Among those younger than 30, more played a game yesterday than watched TV news. 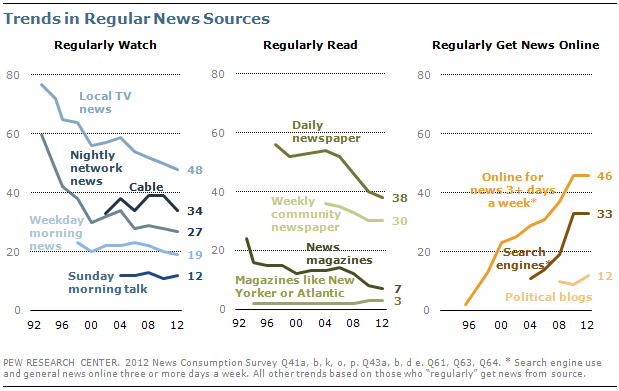 The long-term trends in regular news consumption are generally similar to trends in where people got news yesterday. Among television news sources, the percentage saying they regularly watch local TV news has dipped below 50% for the first time (48%). And the percentage watching cable news channels has fallen five points since 2010 and 2008, from 39% to 34% currently. The regular audience for nightly network news, which declined markedly through the 1990s, has changed little in recent years. Currently, 27% say they regularly watch the nightly network news on CBS, ABC or NBC. This percentage has not varied by more than a point or two since 2006. As in previous news consumption surveys, more say they regularly read a newspaper than say they read a newspaper yesterday. Nearly four-in-ten (38%) say they regularly read a daily newspaper, which is largely unchanged since 2010 (40%) but down eight points from 2008. The proportion of Americans who get news online at least three days a week has leveled off, after a period of dramatic growth. Currently, 46% say they get news online or on a mobile phone or device at least three days a week, unchanged from 2010 (when the question only asked about getting news online). 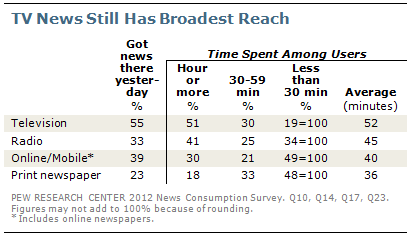 About a third (32%) of the public gets news online every day. As the 201o news consumption survey found, there are substantial demographic and political differences among regular news audiences. 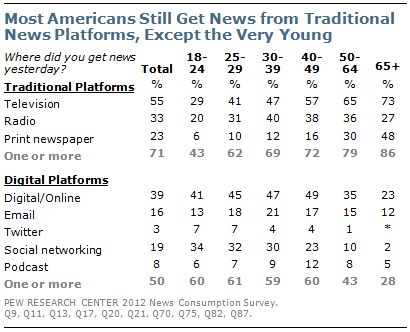 In general, most audiences for individual news outlets are older than the public generally, but there are exceptions. Among 24 news outlets asked about on the survey, news comedy programs – the Daily Show and Colbert Report – attract the largest percentages of young people. About four-in-ten regular viewers of The Colbert Report (43%) and the Daily Show (39%) are younger than 30. Among the general public, 23% are younger than 30. In contrast, audiences for cable talk shows skew much older than the public: 42% of regular Sean Hannity viewers are 65 and older, as are 40% of regular Bill O’Reilly viewers. Among the public, just 17% are 65 and older. Business publications draw a heavily male audience: 73% of those who regularly read magazines such as the Economist and Bloomberg Businessweek are men, as are 71% of regular Wall Street Journal readers. Women comprise relatively large shares of the regular viewers of daytime talk shows, such as The View or Ellen DeGeneres (73%), and morning news shows (62%). The cable talk shows and news comedy programs continue to attract highly ideological audiences. Fully 78% of regular Sean Hannity viewers, and about seven-in-ten Rush Limbaugh listeners (71%) and Bill O’Reilly viewers (69%), are conservatives. Slightly more than a third of all Americans (35%) describe their political views as conservative. Rachel Maddow is the only program whose audience is more than half liberal: 57% of regular Maddow viewers are liberals. Among regular Hardball watchers, 48% call themselves liberal. Additionally, about four-in-ten Daily Show (43%) and Colbert viewers (40%) are liberals. Among the public, just 22% say they are liberals.